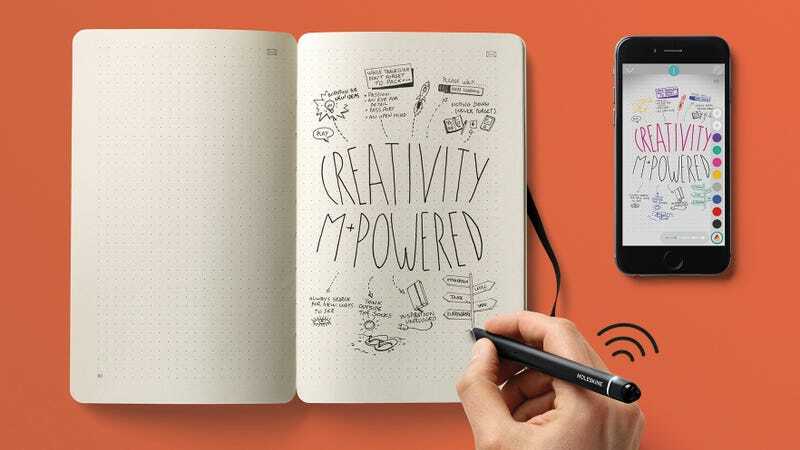 The Moleskine Pen+, a custom-branded version of the Neo Smartpen, uses a built-in camera to track the movements of the pen’s tip on the notebook’s pages. If you lean in and look closely at the above image, you’ll see a subtle but defined pattern on the page—the company calls this nCode technology—that the Pen+ uses to ensure it’s accurately tracking writing movements, position, and what page is currently being used. Accompanying the Pen+ is a new Moleskine notebook which the company refers to as the Paper Tablet. There’s no touchscreen or electronics of any kind inside it, but Moleskine has cleverly made its pages bulge outward with a rounded contour, giving it the appearance of a digital tablet. The design doesn’t add any unique functionality, but it will make it easier to discern the Paper Tablet notebook from other Moleskines you might be actively using—especially if they all have the same black cover.